The typical day? Not defined. We took some time during our fire sim to celebrate Towel Day. I’m wearing an oxygen mask with a 7-minute supply of oxygen. In case of an ammonia leak, we would wear this mask for the first response and then swap it for the mask Butch is wearing – with the pink ammonia cartridges instead of the red fire ones. You do the swap with eyes closed and purge the inner volume before opening them! 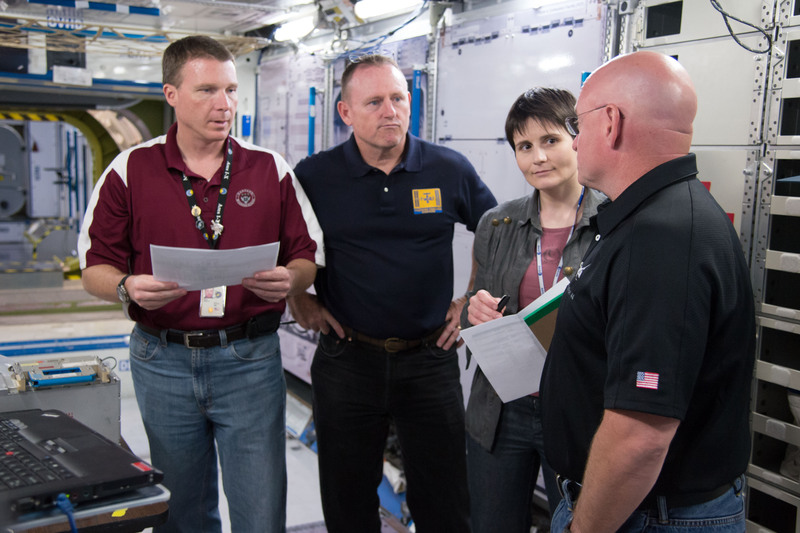 What does the typical day of an astronaut in training for a space mission look like? This is one of the most common questions I am asked. Do I have an answer? Not really. Let’s talk about my last training trip to the Johnson Space Center in Houston this last May: three weeks, short but intense! An easy start on Monday morning with an update on emergency procedures, which have recently undergone significant changes since my last simulations. 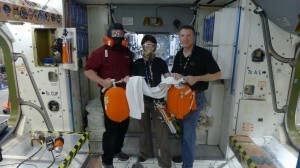 New ammonia masks, for example: your life insurance in case the ISS became contaminated with ammonia from the external cooling lines. The sequence of actions to purge the mask, before you open your eyes in it, is something you want to be able to do in your sleep! In the afternoon, a refresher class on the Dynamic Skills Trainer, the simulator of the robotic workstation in which we practice ‘flying’ the Canadarm 2. And I certainly need a refresher, because it has been a year since my last robo training. If you’re in urgent need to review what you do when you have an unmanned cargo vehicle holding position at 10 meters from Station and several control centers holding their breath until you capture it with the robotic arm, this is the class to be in. After reminding me of the overall choreography and going over a standard pre-capture brief, my instructor gives me a series of scenarios to refresh my skills at the robotic hand controllers. Be it Dragons or HTVs, all vehicles on real missions have been nice and steady so far, but the rotation and translation rates we practice with in training can make you sweat! Fast forward to the next morning and I’m sitting in a review class about on-board application software, a suite of tools that is so essential to daily life and work on ISS that a refresher is scheduled at the beginning of every training trip to Houston. You don’t quite remember how to do a search in the inventory management system? You need to review how to attach a note for the ground control team related to a specific activity? You want to know how to figure out what food container should be opened next or where to find new printer cartridges? This is the class to ask all those questions. From daily operations to serious contingencies: the next class is about dealing with malfunctions of your EVA suit during a spacewalk. Always a great chance to review the schematics of the suit life support system, these classes are meant to get familiar with the cuff checklist that spacewalkers carry on their left arm. Be it a failure of cooling or ventilation, a loss of communication or a high level of CO2 in the suit, the crewmember is expected to apply the proper cuff checklist procedure to deal with any off-nominal event. After a final malfunction scenario, time for a quick walk to the Food Lab for a special lunch: a food tasting session with Butch and Terry! 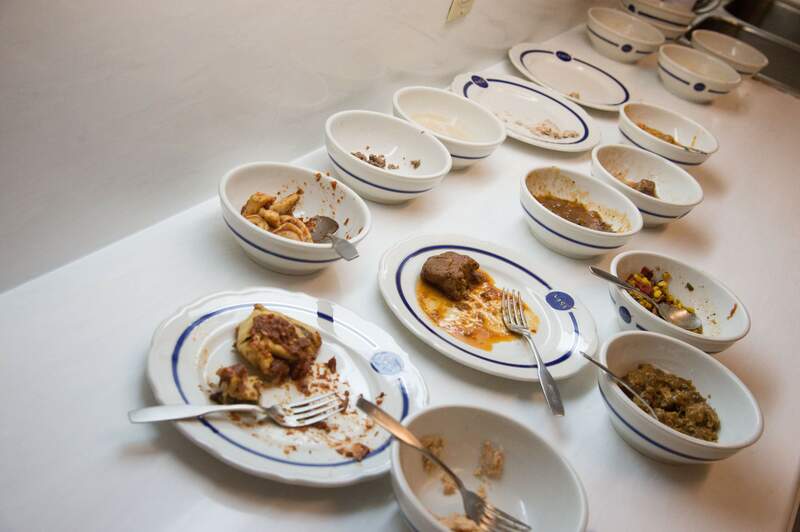 Starting with beverages and on to food items from the ISS menu we quickly eat our way through a series of about 60 dishes, which we score on an evaluation sheet. Should we decide to add extra pouches from the ISS menu in our bonus food containers, these scores will remind us which ones of the hundreds of available items we liked best. Good to know! But no, in case you’re wondering: the standard food supply is not adapted to our preference. That would be nice, but a logistics nightmare! An easy brief to start the afternoon: an introduction to the world of crew provisioning and an overview of some documents that we’ll help us be less confused when, next week, we’ll have to start make some choices. For first time flyers things can be overwhelming: what shorts are better, what T-shirts? Go for the US item or the Russian equivalent? Long or short sleeves? Half and half? Thin or thick socks? Whatever choice we make, we’ll have to live with it for six months, therefore I’m infinitely grateful to the patience and expertise of the crew provisioning team! End of the afternoon in the gym, fast forward to Wednesday. It’s an EVA-intensive day. We start out with a class on tool configuration, the less glamorous part of a spacewalk. How do you gather all the tools and tethers? How do you thoroughly inspect each one of them before taking it out and maybe entrust it with your life? Short break and then on to a special class on the Common Berthing Mechanism, which allows the docking of visiting vehicles like Dragon or HTV to Station. 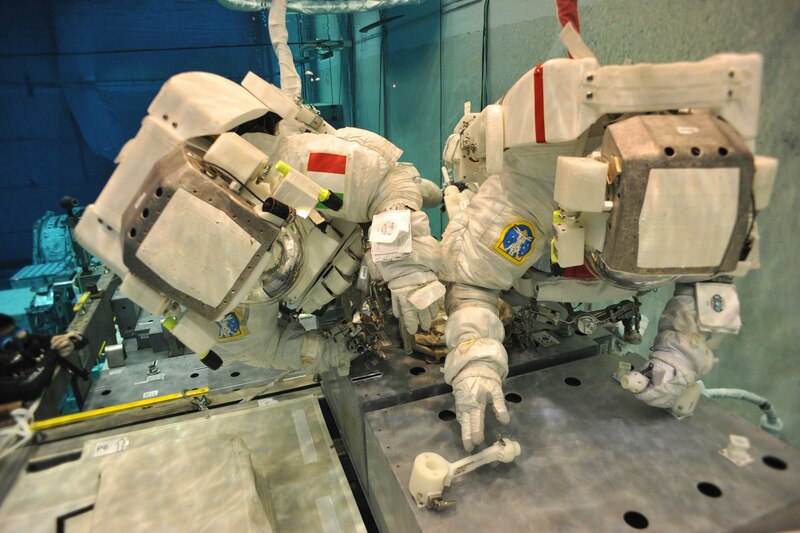 It’s a special class because it’s taught by the maintenance instructor team, but our EVA instructors assist: if the CBM breaks, guess what… most likely you need to go outside to fix it! After lunch, short drive to the Neutral Buoyancy Lab (NBL) with Terry for a preparation class for Friday’s spacewalking training. We call those classes 1G. They give us ample opportunity to handle the actual hardware that we will be working on in the water, as well as the NBL models, which have unavoidable specificities due to the pool environment. Treadmill harness sizing is next on the day’s plan. 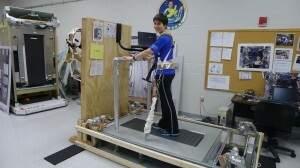 I get to try different sizes to make sure the harness that will be sent for me to ISS will be a proper fit. Just like the straps of a good backpack, the load that presses you down onto the treadmill and allows you to run in weightlessness needs to be mainly on your hip, rather than your shoulders. Simply trying to walk while wearing the harness is quite a strange sensation and one of those things that probably feels better on orbit where you don’t have your own weight. At least, that’s what I hope! Well, let’s stop here. I’m sure you got the point by now. No day is like another! In the following couple of weeks had a chance to participate in several emergency simulations with Terry and Butch and one full afternoon of routine ops where we were joined by Scott. I refreshed my Crew Medical Officers skills and I completed my course on the ISS motion control system. 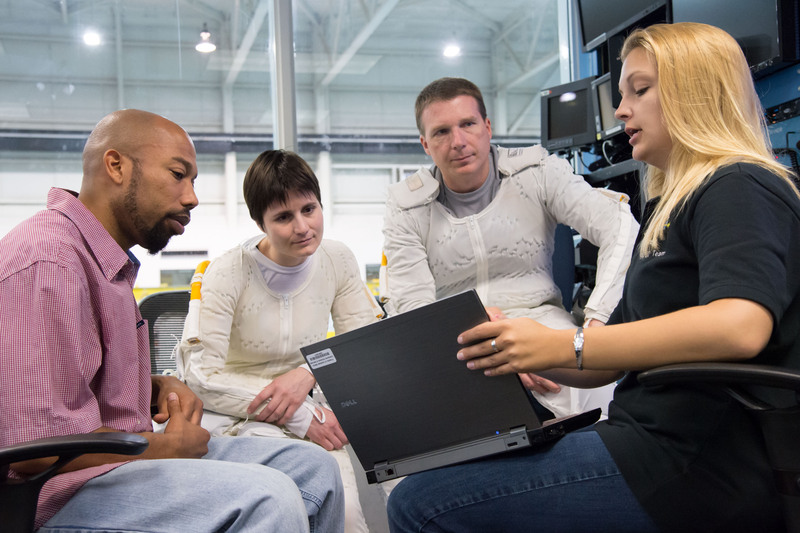 I did more robotics training and a four-hour simulation of Dragon rendezvous ops. Talking about Dragon, I flew to California for a day of training at the Space X facilities. 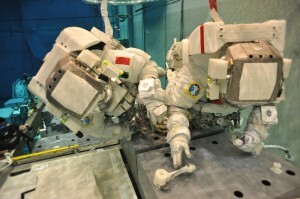 And I spent two days in the NBL under water practicing spacewalks. On one of those days, I had the incredible fortune of working on procedure development for the contingency EVA that was performed by Chris and Tom the very next day, fixing an ammonia leak that had taken down one of the ISS power channels. It was an amazing experience to see the entire EVA community work day and night to get two spacewalkers out of the airlock within less than two days from anomaly detection. Have I mentioned already that I’m inspired every single day by the dedication and talent of people in the Space Station community? I’m sure I have, but I’ll never get tired of repeating it. Thank you for sharing this. Because of Chris Hadfield my love of space has been renewed and I am now enjoying following and reading as much as I can about every aspect. A favourite movie while growing up was Space Camp and although I know a lot of that is impossible I’m wondering if there are actually Space Camps for normal people like me to attend? Of course, there is Space Camp in Huntsville, Alabama. I think they also have adult programs. How about a ride in the world’s biggest centrifuge?